Things were not supposed to go this way. At 1.9 million acres — 53 times the size of nearby Bryce Canyon National Park, bigger than Rhode Island and Delaware combined — the Grand Staircase was to have been the premier research monument in the national system, an outdoor lab for the practice of science. The 1996 proclamation by President Bill Clinton, who established it under the Antiquities Act, “identified the Monument’s birth in science,” as the BLM’s website describes. The vast Grand Staircase, Clinton said in his proclamation, was still a frontier, much of it wild, unspoiled, with “a spectacular array of historic, biological, geological, paleontological, and archaeological objects” that required protection, care, study. 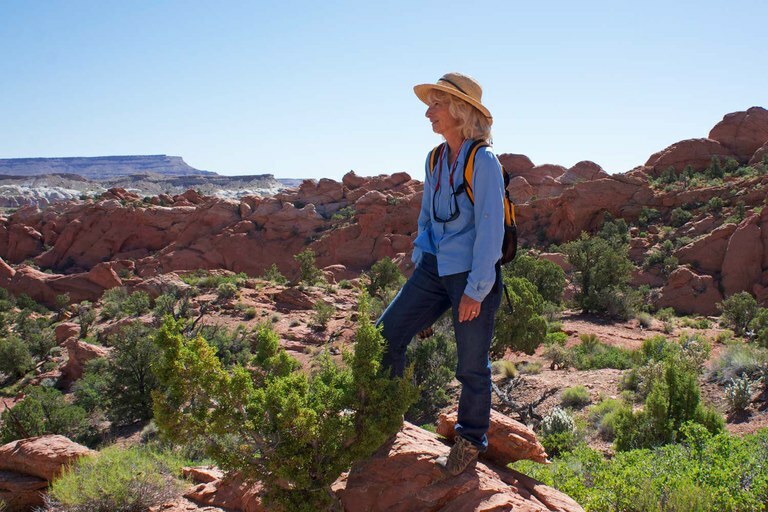 Carolyn Shelton, who retired from her position as assistant manager at Grand Staircase-Escalante National Monument in 2016, feels like she wasn't able to do her job because the monument didn't have enough resources or staff. One day this spring, Shelton invited me for a hike on the Grand Staircase not far from her home in Kanab, Utah. The afternoon before our rendezvous, I drove from the town of Escalante south across the Staircase on a rough dirt road called Cottonwood Wash. The monument’s name is no mere marketing ploy: It is a geological designation. The staircase it refers to runs from the youngest cliffs in the north, the Pink Cliffs of Bryce Canyon, to the oldest, the Vermilion Cliffs way in the south. Beyond the Vermilion Cliffs is the oldest step of all, the Grand Canyon, exposing the most ancient rock. Among these steps there are plateaus and valleys, countless peaks, folds, streams, forests, mesas, gorges, buttes and canyons. I’d been up on the Kaiparowits Plateau and in the slot labyrinths of the Escalante River’s tributaries and through the deep watery places of the Box-Death Hollow Wilderness and in the tall pines on Canaan Mountain, but I had never been down Cottonwood Wash. It was a winding, dusty, washboard road, hot and shadeless and lonely, crossing for 40 miles across scrub-steppe hills, fields turned golden with sunflowers, and canyons colored purple, mocha, mauve and orange. Halfway to Kanab, at sunset, I stopped. The night was balmy, sweetened with the spring bloom, and moonless, the stars lavish. I saw no one in another car, no one on foot, and no one at my campsite, which was nothing more than a level spot under a piñon pine in a sandy turnout beside the road. Before bed I set out in the dark into a nameless little slot canyon, wandering for an hour or so, listening for the night music of wrens, and loafing in the sandy bottom with boots off. Shelton is 60, petite, with a lush head of hair and a long Roman nose that gives her a serious, philosophical air. That she was willing to talk with me was both a pleasure and a shock. For months, living in southern Utah near the Grand Staircase, I tried to interview current and former employees on the record about the state of affairs. But no one would talk. Even in retirement, monument staffers were afraid. We met by the side of another of the innumerable dirt roads in the Staircase, and ditched our cars, setting out cross-country. Shelton wanted to find a passage up a line of jagged cliffs called the Cockscomb. She and her husband, Jim, a retired homebuilder who joined us for the hike, spend a lot of time outdoors, bird-watching and fly-fishing and hunting for deer and elk, pheasants and ducks and chukars. Mostly they hike. We never got to the Cockscomb. Instead, we strolled in an aimless pleasing way, stopping to sniff at wildflowers in a pygmy forest of piñons and junipers. The day grew very warm and the gnats swarmed. I was stunned by the variety of the flowers, the colors, the perfumes: Hopsage with its intricate fuchsia petals, creamy milkweed beloved of monarch butterflies, the white Sego lily, purple phacelia, orange globemallow so small and delicate, the garish red fingerling petals of Indian paintbrush, the claret cup cactus, the pale yellow petals of the prickly pear, the white and pink of the flowering buckwheat. 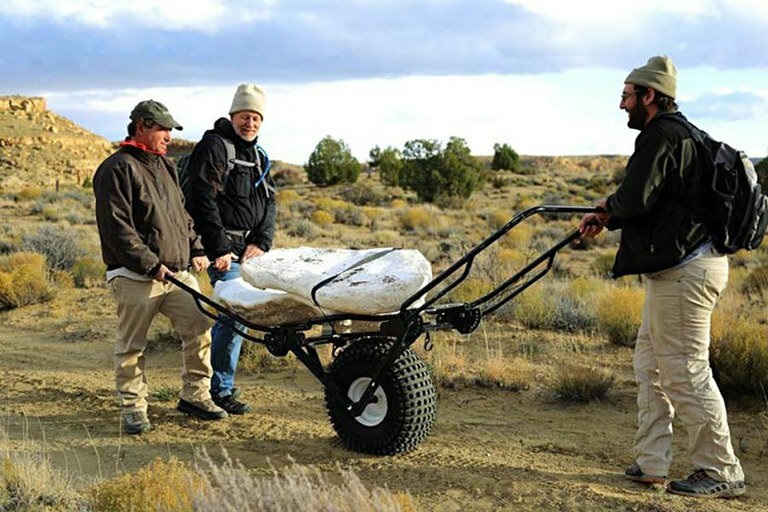 Paleontologists remove hadrosaur material, which is approximately 80 million years old) from the Wahweap Formation in the Kaiparowits Plateau in Grand Staircase-Escalante Natuional Monument. Dozens of different dinosaur fossils have been found in the monument, but now only one paleontologist is staffed there. Not long before meeting Shelton, I took a walk along the Escalante River to spend time with the bees. The astonishing diversity of flowers in the spring brings a stampede of pollinators. Some are bright orange and furry, some metallic-looking, lime-green, others yellow or black or purple or neon-blue, all exquisitely distinct. When Shelton started in 2001, the Staircase had 140 employees, with more than half involved in science and research. There were two full science divisions: Cultural and Earth Sciences and the Biological Sciences. The science staff included botanists, soil experts, hydrologists, geologists, archaeologists, paleontologists and ecologists. The BLM maintained a dedicated $1 million annual fund for university research on the monument. Grand Staircase-Escalante is known for its geologic formations and archaeological artifacts. Here, some petroglyphs are marred by someone who tried to cut them from the rock. Before coming to southern Utah, Shelton worked at BLM offices across the American West. Her first job with the agency, in 1976, was as an interpretive specialist in the Mojave Desert near Barstow, California, developing educational programs and exhibits. Later, she worked in Colorado, Oregon and Washington, designing visitor centers and museums. The early history of the Latter-day Saints was one of separatism and sedition, driven by the belief that they were the chosen people on the continent and a persecuted people. Insular and apart, the Utah territory settlers in the 1840s, led by the prophets in Salt Lake City, dreamed of an independent Mormon nation that encompassed not just Utah but all of Nevada, parts of Idaho and Oregon, and a piece of Southern California. It was to be a religious imperium, with broad exploitation of natural resources and a port in San Diego for trade overseas. In the years before Utah joined the Union, the Mormon leadership under prophet Brigham Young resisted the federal center with a passion that approached hatred, undermining U.S. authority in the territory and finally advocating the violent overthrow of the government in D.C. They wanted its replacement with a theocracy led by the chosen ones. “Much of the heated political rhetoric in the West about the evil federal government began in Utah,” historian Will Bagley, author of many books of Western history and himself a former LDS member, told me recently. 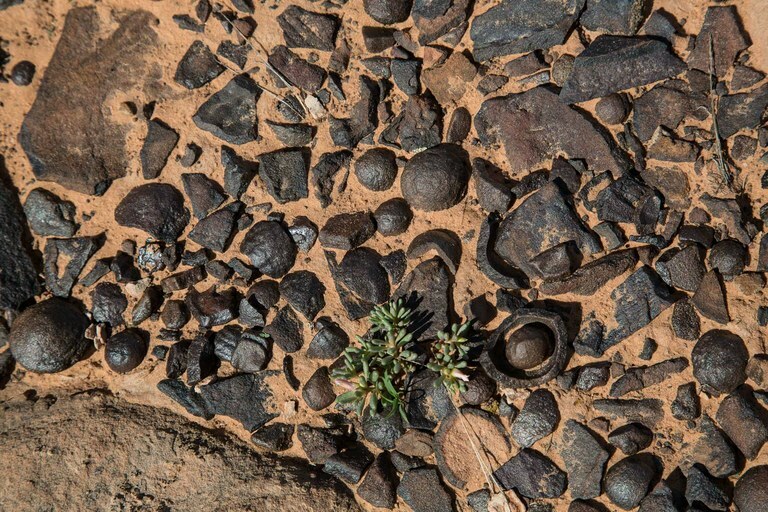 Iron-coated pebbles known as "Moqui marbles" are scattered across the sandstone at Grand Staircase-Escalante. They were formed about 20 million to 25 million years ago. Cattle graze along Hole-in-the-Rock Road. 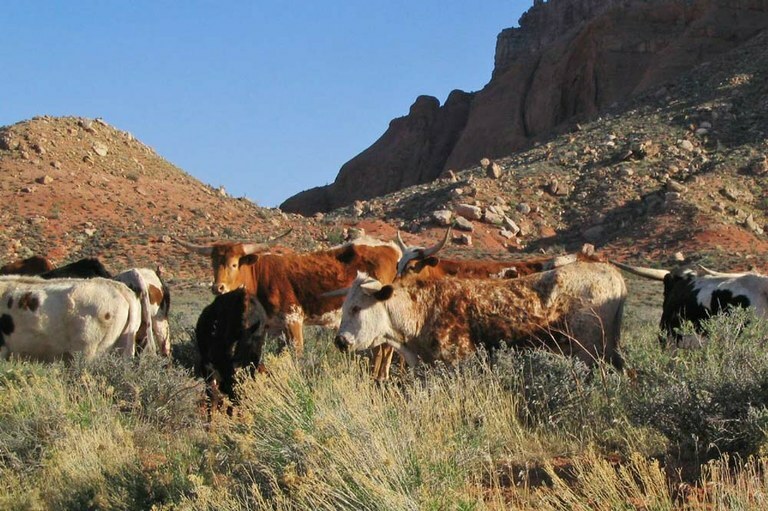 About 97 percent of the monument is still open to cattle grazing. From the very beginning, Utah officials — almost all of them conservative, Republican, Mormon — mounted a campaign of disinformation about the Grand Staircase. And this only served to exacerbate staff conflicts. Much of the campaign amounted to “outright lies,” Shelton told me. It was said that private land was condemned; that the land was “stolen” from local landowners; that hundreds of public roads were closed. The lies trickled into the populace and calcified as rural myth. At the salon in Kanab where Shelton gets her hair done, a hairdresser told her that after Clinton seized the land, he ordered the government to alter the maps of the Staircase in a conspiracy to erase the record of private ownership. Southern Utahans who tell this story — Shelton has heard many iterations of it — never know the names of the people whose land was stolen. That’s because those people don’t exist. The land was already publicly owned, managed by the BLM. Shelton notes that even with the straitened funding and staff cuts during the Bush and Obama years, one management program went untouched: livestock grazing subsidies. “That’s because grazing is sacrosanct,” she said. At the same moment they were losing science staff, the Staircase hired more range management staff, in positions that were “higher-graded” with better salaries. “Trying to effect change is even more of an uphill effort now,” a former staff botanist named Laura Welp told me. Welp now works for the nonprofit Western Watersheds Project to ameliorate environmental damage from public-lands grazing. “My botany job was filled in-house by moving a young guy over from the range program who has lived in the area all his life, went to the nearby college where he was taught by livestock sympathizers, has extensive family and religious ties to the permittees and runs cattle himself on the adjacent field office. His understanding of advocating for the resource is running the bulldozer for the extensive vegetation treatments that are now going on to provide forage.” According to Welp, the recently hired assistant monument manager for natural resources is a former range staffer. He is also a bishop in the same Mormon church attended by the BLM official who hired him. 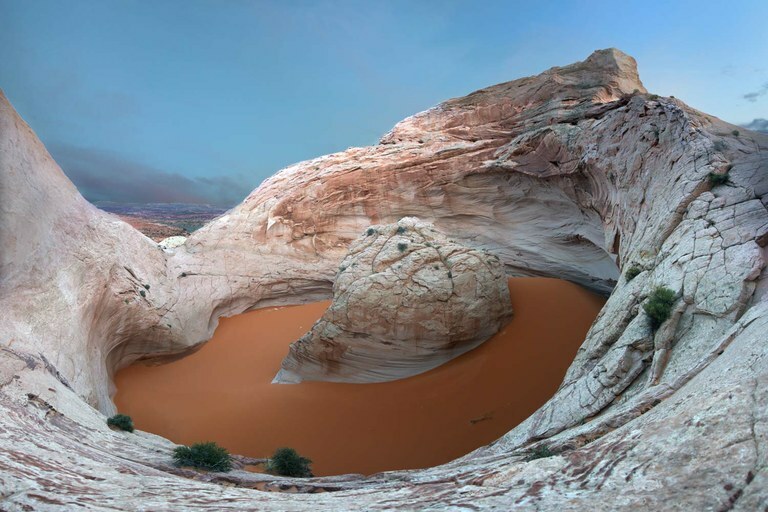 The Islomania Dome, one of the many unearthly rock formations in Grand Staircase-Escalante National Monument. 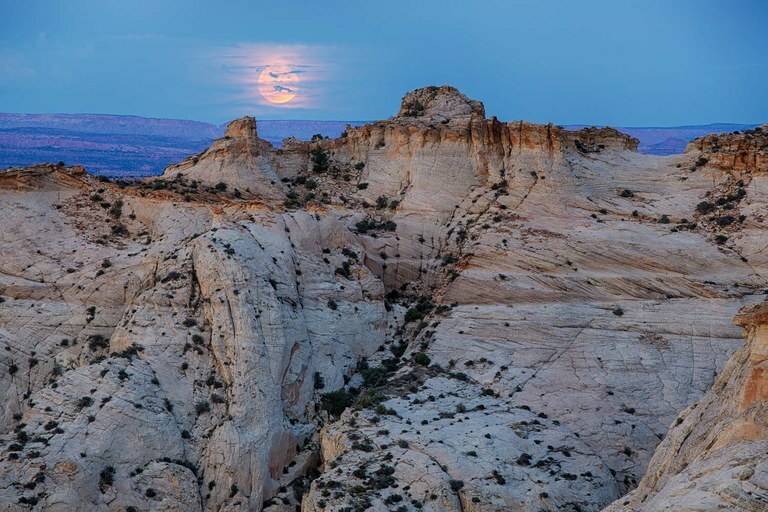 The moon rises over Grand Staircase-Escalante National Monument. 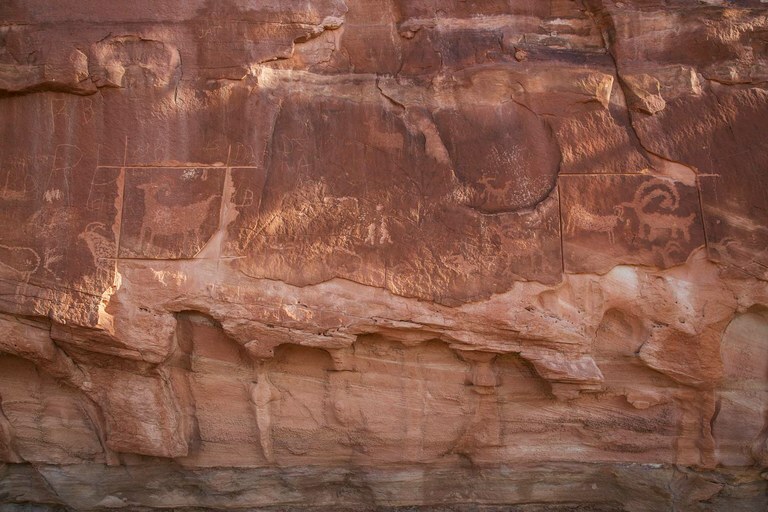 The first monument up for review is the 1.4-million-acre Bears Ears National Monument, which was carved out of BLM and Forest Service land in southern Utah by Obama during the final days of his presidency. In early May, not long before I met with Shelton, she joined a group of 300 or so demonstrators in Kanab who had gathered to meet Zinke as he travelled across southern Utah. He was scheduled to fly into the Kanab airport, and that’s where the demonstrators awaited him. But Zinke ignored the crowd in Kanab, and instead began his review with a series of private meetings with county commissioners, who were described as “jubilant” in press accounts. He met with Herbert, whose staff had organized the trip, and with members of Congress who have been prominent opponents of the Grand Staircase and Bears Ears, notably Utah Republican Rob Bishop. He then spent several hours on horseback with local ranchers, wearing a cowboy hat. Christopher Ketcham is a writer whose work has appeared in Harper’s, Vanity Fair and GQ, among others. He can be reached at [email protected].